The high-speed bikes of the legendary brands having abundant power are coming on Indian streets almost every day. The biking scenario is changing rapidly in India, but not the road safety. But the real question is where to unleash this raw power? Neither the roads are in good condition nor the people taking road safety seriously. With our recent observation, we concluded that high-speed bikes can be ridden safely while wearing all safety gears on Indian highways under the speed limit of 100 km/h. Any speed above 100 km/h raises the risks considerably. In India, you really never know who will cross your way from nowhere. At some places, there are no traffic signs. Not all roads are properly marked. This leads to very dangerous situations for riders riding the high-speed bikes. The high-end bikes are capable of cruising at 130-140 km/h easily; which means there is little time or only a fraction of second to react to any situation arising in front of you. But, this doesn’t mean you should not ride high-speed bikes; if you genuinely follow safety & rules. Gone are the days when there were only a few choices for riders. Now iconic brands like Triumph, Ducati & Yamaha are available. Even entry-level high-speed bikes are available from brands like KTM & Benelli. Given a lot of choices, you must ride to fulfill your passion. In this article, we have compiled some points which might help you in riding such high capacity, high-speed bikes on Indian streets. The first and most important thing that you must do when you are purchasing a bike is to read its user manual. Most people don’t read the manual before riding their high-speed bikes. This may cause serious damage to the engine or many other bike parts. To avoid such mishaps, you must know & understand things such as the engine running in period, service interval and basic maintenance like lubricating an open chain. One more thing, if you don't read all the features you will never recognize them even after years of using your bike. Features like cruise control, damping control, riding modes may remain unexplored just because you didn’t read the bike's user manual. So, read it carefully and completely. What Speed is safe for high-speed bikes? Speed is one of the most crucial factors! Only on highways, you can explore the true potential of your high-speed bike, not in city areas. However, you have to keep a constant vigil around you. Watch out for Pedestrians crossing road on dividers because they will never see your bike. From the left side of the road, pedestrians, bullock carts, 'feriwallas' (cart-pullers) & tractors with trolleys may suddenly pop up in front of you. Also, some speed-maniacs may come up suddenly from the left side and overtake you at high speed as if they wanted to win a race. To avoid these dangers, use rear view mirrors constantly. In towns and cities, even if you feel speeding up, never do that. Smaller 100cc scooters may overtake you suddenly. So, have patience and let them go. Riding high-speed bikes come with great responsibility. Always remember that with a slight twist to your throttle you will be ahead of them within seconds. However, town/city areas- congested with traffic are not the right place to speed up, so let them go. A must for high-speed biking! A wide range of safety gears is available in the market including full racing suits which keep you safe on tracks & on roads. Always remember that you purchase safety gears for your own safety and not for someone else. Safety has prime importance in high-speed bike riding. So, wear your gears irrespective of the distance of your ride. We strongly recommend buying safety gears rather than accessories while purchasing a high-speed bike. 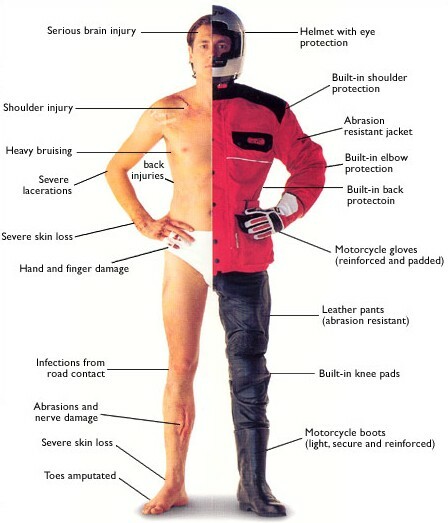 Following image shows riding gears along with injuries from which they protect you. Never leave your bike unattended especially when you are on a ride, as you never know who will approach you with the wrong intention. There are rising cases of high-end bike thefts in India. During prolonged storage, clean your bike and apply lubricant on metal surfaces and follow any additional instructions given in the user manual. Sometimes, people prefer transporting their high-speed bikes to a remote location to ride. Generally, in such cases, transportation is done by trucks or railway. It is very essential to properly pack the bike before sending it through transport. Also, to fortify the protection, it is advisable to get insurance for such bikes. Buying an insurance will help the rider to recover at least some part of the expenses in case of any damage. After all, it’s entirely on your right hand. Every twist you give to the accelerator, you are at more risk. But, if you follow the traffic rules and speed limits, your ride will be exhilarating, remarkable and memorable!